The Plasmodium falciparum parasite is transmitted in its sexual gametocyte stage from man to mosquito and as asexual sporozoites from mosquito to man. Developing gametocytes sequester preferentially in the bone marrow, but mature stage gametocytes are released to the bloodstream. Sexual stage parasite surface proteins are of interest as candidate target antigens for transmission blocking vaccines. In this study, the transcript profiles of rif and var genes, known to encode surface antigens in asexual blood stage parasites, were investigated at different stages of 3D7/NF54 gametocytogenesis and in sporozoites. Gametocytes exhibited a rif transcript profile unlinked to the rif and var transcript profile of the asexual progenitors. At stage V, mature gametocytes produced high levels of a single rif gene, PF13_0006, which also dominated the rif transcript profile of sporozoites. All var genes appeared to be silenced in sporozoites. The most prominent variant surface antigen transcribed in both gametocytes and sporozoites of 3D7/NF54 is a single variant of the RIFIN protein family. This discovery may lead to the identification of the parasites binding ligands responsible for the adhesion during sexual stages and potentially to novel vaccine candidates. Plasmodium falciparum is transmitted from infected humans to mosquitoes via sexual stages called gametocytes. Immature gametocytes arise from erythrocytic asexual stages and sequester preferentially in the bone marrow  for about 9-12 days before reaching maturity and emerging into peripheral blood . Unlike other species of malaria parasites, five different stages of P. falciparum gametocyte development have been described in vitro by morphological criteria , known as stages I to V. Only at stage V are gametocytes released to the bloodstream and become infectious to mosquitoes of the Anopheles sp. A mean circulation time of 6.4 days with a range of 1.3-22.2 days has been reported , but aggregation of the mature stage V gametocyte in the sub-dermal capillaries has been proposed [4, 5]. In the mosquito midgut, the male gametocyte transforms into eight motile microgametes and emerges from the erythrocyte within minutes (exflagellation), whereas the female emerges as a single round shaped macrogamete. Fertilization is required to initiate the mosquito stages of parasite development, resulting 10-18 days later in infectious sporozoites ready to invade a new human host. It is thought that the sequestration during maturation of P. falciparum gametocytes allows avoidance of phagocytic clearance in the spleen, as immature sexual stages circulate in splenectomised hosts . Several host receptors have been implicated in gametocyte adhesion, but at different stages of development. At stages I-IIA, CD36 seems to be the main receptor for adhesion [7–9], and at stages III-IV, ICAM-1, CD49c, CD166, and CD164 are candidate receptors . Parasite ligands responsible for this sequestration are unknown, but identification of the relevant surface proteins is of great interest as they could be potential transmission blocking vaccine candidates [11, 12]. Several multigene families encode proteins on the asexual parasite-infected erythrocytic surface such as PfEMP1, (Plasmodium falciparum erythocyte membrane protein 1), STEVOR (subtelomeric variable open reading frame) and RIFIN (repetitive interspersed family), and these are obvious candidates for studying gametocyte adhesion [8, 9, 13]. Hayward et al  found that the adhesion of early stage gametocytes to CD36 is mediated by PfEMP1, but not at later stages, where the knob structure is no longer present, and PfEMP1 seems to be confined to the parasite cytoplasm [7, 8]. PfEMP1 s (200-400 kDa) are encoded by approximately 60 var genes per genome. The clonal variant proteins are known to mediate cytoadhesion of the infected erythrocyte to host receptors  and are associated with development of immunity to asexual stages and protection from severe disease [15, 16]. Based on sequence analysis, var genes were grouped in five different types [17, 18]. A study of var transcript abundances in gametocytes showed a degree of var transcription programming favouring a subset of type C genes in gametocytes unlinked to the phenotype of asexual progenitors and unlinked to the transcription of stevor genes . RIFIN proteins are encoded by the two-exon rif gene family of interspersed repetitive DNA, predominantly located in the sub-telomeric regions. Each parasite genome encodes around 200 genes encoding proteins of 30-40 kDa. RIFINs have conserved amino and carboxy termini, and one to two predicted transmembrane domains delineating a proposed extracellular variable region. No function has yet been ascribed to RIFINs. It has been proposed that RIFIN variants belonging to two disctinct subgroups designated A- and B-type RIFINs , show different subcellular localization patterns. A-type RIFINs were found to be transported to the surface of the infected erythrocyte and B-type RIFINs were retained inside the parasitophorous vacuole . Furthermore, Petter et al  using a semiquantitative cDNA cloning approach provided evidence for stage-specific transcriptional regulation patterns during gametocytogenesis for the two rif-types. Expression of these multigene families has to date not been systematically investigated in sporozoites. In this study, variant-specific real-time amplification was used to provide the first quantitative transcriptional analysis of each member of the rif gene family in both P. falciparum gametocytes and in sporozoites. A single rif gene was found to dominate transcription in both sporozoites as in gametocytes. Parasites of P. falciparum 3D7 and NF54 were cultured and induced to gametocytogenesis as previously described [13, 22] at London School of Hygiene and Tropical Medicine, London, and at Radboud University Nijmegen Medical Centre, Nijmegen, respectively. RNA was taken from 3D7 gametocyte cultures on days 3, 5, and 10 and the gametocyte stages were determined as predominantly stage II, III, and V, respectively. RNA was taken from NF54 gametocyte culture at stage V. RNA was also taken from NF54 sporozoites isolated from the salivary glands of Anopheles sp. as previously described . Parasites were harvested in Trizol reagent (Invitrogen) and total RNA was extracted according to the manufacturer's instructions (Invitrogen). Samples were treated with DNase I (Sigma) to digest any genomic DNA and tested in real-time PCR for contamination, using a primer set for the seryl-tRNA synthetase gene, p90. RNA was reverse transcribed from random hexamers, using Superscript II (Invitrogen), according to the manufacturer's instructions (Invitrogen). RNA from previous studies stored at -80°C  was prepared for cDNA as described above. The RNA available was that taken from a 3D7 parasite line selected with IgG from semi-immune children, 3D7-Dodowa1, at the asexual ring stage and gametocyte stage III and from an unselected culture of clone 3D7 at the asexual ring stage, gametocyte stage II, III, and V.
The rif primer pairs described previously , var primer pairs, and primers to the endogenous control genes seryl-tRNA synthetase and fructose-bisphosphate aldolase, p61, described previously  with modifications  were used. Quantitative PCR was executed on a Rotorgene RG-3000 thermal cycler (Corbett Research) applying QuantiTect SYBR Green PCR Master Mix (Qiagen) with primers at 20 μM, and internal control genes seryl-tRNA synthetase and fructose-bisphosphate aldolase, used for normalization as previously described . Gene-specific standard curves were produced by determining the amplification efficiency relative to the single copy housekeeping gene, seryl-tRNA synthetase, based on quantitative measurements of 10-fold dilutions of genomic DNA and used to calculate the transcript copy number of each gene in tested cDNA. Plasmodium falciparum parasites were induced to develop into sexual gametocyte stages and the RNA was isolated for transcriptional analysis. 3D7 gametocytes were induced in three separate experiments to isolate stage II, III and V, whereas NF54 stage V gametocytes were available for one experiment. 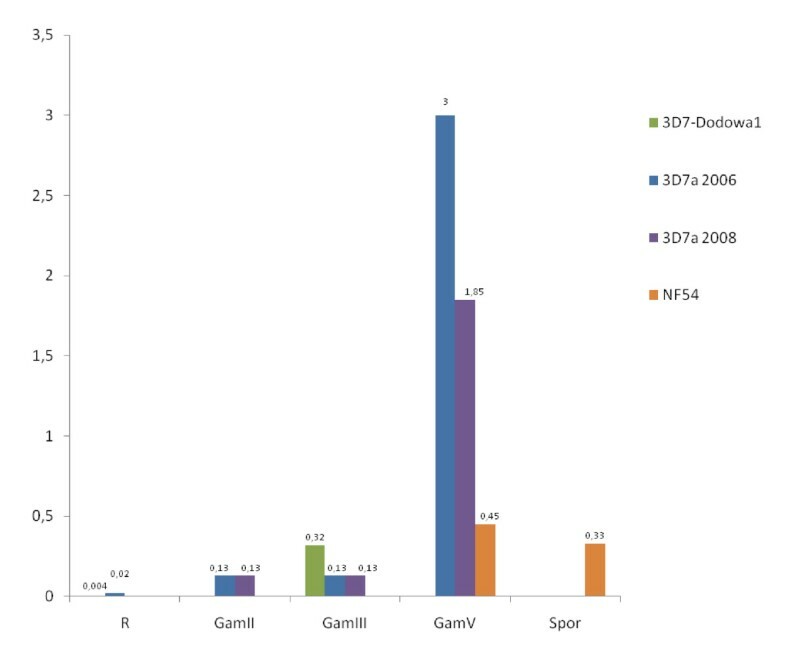 In gametocytes, rif transcript abundances increased as the parasites matured and transcripts of PF13_0006 and PFI0025c progressively dominated, with PF13_0006 being the most dominant at gametocyte stage V (Figure 1). The transcript abundance of PF13_0006 was more than 100 times higher at gametocyte stage V than during the asexual stages (Figure 2). PF13_0006 also dominated the rif transcription in sporozoites (Figure 1). Transcript abundances of rif genes. (A) Transcript abundances of rif genes upon differentiation from asexual to sexual reproduction in a 3D7 parasite line selected with IgG from semi-immune children, 3D7-Dodowa1, an unselected culture of clone 3D7 (RNA from year 2006 and 2008), and an unselected NF54 parasite line. (B) Transcript abundances of rif genes in NF54 sporozoites. Transcript abundances were measured by quantitative PCR using a set of primers that amplify 154 rif genes from clone 3D7/NF54. Transcript abundance of each rif gene is shown as a proportion of the total transcript abundance of rif genes in a sample. 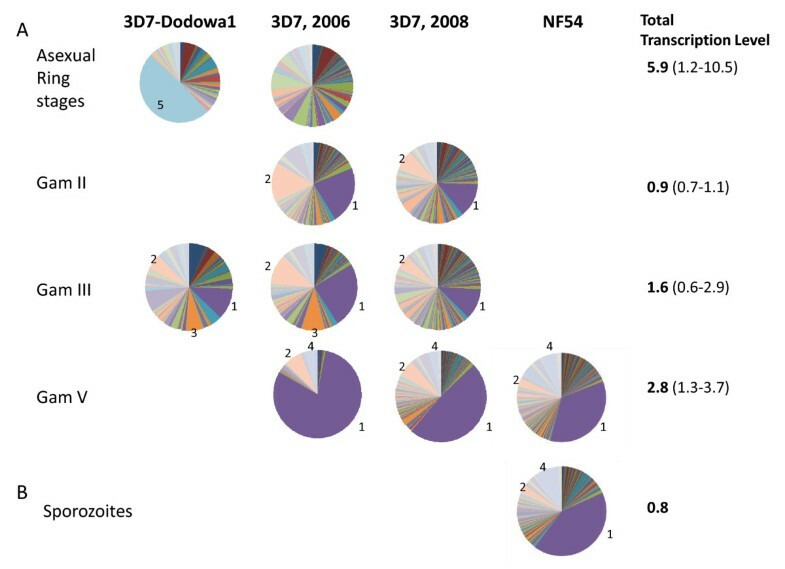 Numbered sectors of the pie charts correspond to the following genes: 1, PF13_0006; 2, PFI0025c; 3, PFA0030c; 4, PFL0025c; 5, PFD1230c. Average transcript abundances are shown as the total transcript abundance of rif genes normalized to the average transcript abundance of endogenous control genes, seryl-tRNA synthetase and fructose-bisphosphate aldolase. Transcript abundance of PF13_0006 during differentiation from asexual to sexual reproduction and in sporozoites. Transcript abundance of 1 corresponds to the mean level of two control genes, seryl-tRNA synthetase and fructose-bisphosphate aldolase. R, ring stage; GamII, gametocyte stage II; GamIII, gametocyte stage III; GamIV, gametocyte stage IV; GamV, gametocyte stage V; Spor, Sporozoites. The colour codes identify the parasite culture from which RNA was purified. Gametocyte stage parasites were induced from two different 3D7 lines. One unselected 3D7 and one 3D7 line selected with IgG from semi-immune children to select a variant surface antigen phenotype associated with severe malaria, 3D7-Dodowa1 . The 3D7 and 3D7-Dodowa1 differed in their var transcript profiles at ring stage but showed similar var transcript profiles at gametocyte stages . The rif transcript profiles of the two 3D7 lines also differed at ring stage parasites but appeared similar at the gametocyte stage III (Figure 1). RNA from later gametocyte stages of the selected line 3D7-Dodowa1 was not available. 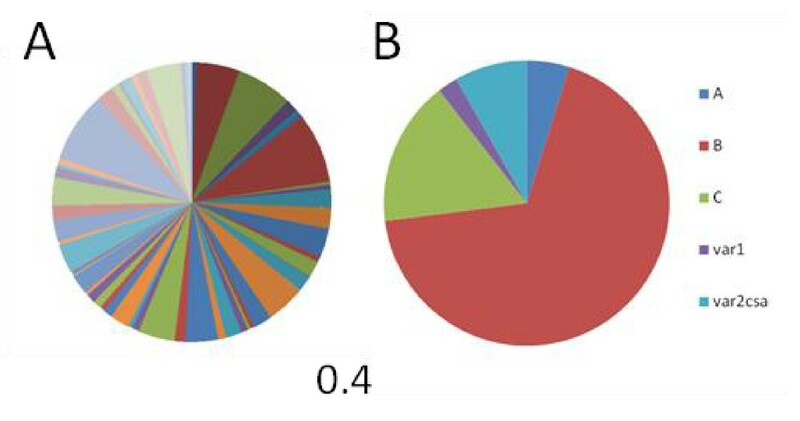 The transcript abundance of var genes in sporozoites were investigated and showed that the transcript distribution was diverse and the levels were low (Figure 3) compared to those found in asexual ring stage- and gametocyte stage V parasites. Total transcript abundances of 0.4 (Figure 3), 55 and 3, respectively . Transcript abundances of var genes. (A) Transcript abundances of each var gene shown as a proportion of the total transcript abundance of var genes in sporozoites of clone NF54. Transcript abundances were measured by quantitative PCR using a set of primers that amplify 59 var genes from clone 3D7/NF54. (B) Transcript abundances of each var gene shown as a proportion of the total transcript abundance of var genes and shown as proportion of var types according to the type described by Lavstsen et al : A, B, C, var1, and var2csa. The total transcript abundance of var genes normalized to the average transcript abundance of endogenous control genes, seryl-tRNA synthetase and fructose-bisphosphate aldolase is shown. For comparison, asexual ring stage- and gametocyte stage V parasites showed total transcript abundances of 55 and 3, respectively . Antigens expressed on the surface of parasites and infected erythrocytes are attractive vaccine candidates. In this study, the transcription of variant gene families known to be expressed on the surface of infected erythrocytes was investigated. The data demonstrate a stage-specific transcription of rif genes in the developing gametocyte with up-regulation of a single rif gene: PF13_0006, in the mature stage V gametocytes. This result is supported by the study by Petter et al , who reported, using a plasmid clone counting approach, that the B1-type rif gene, PF13_0006 , but also PFI0025c, another B1-type rif gene dominated the rif gene transcript profile of developing stage II and III gametocytes. Here, we show that regardless of the rif and var transcript profile of the asexual progenitor, PF13_0006 dominates the transcript profile in gametocyte stages of both 3D7 and NF54 parasites lines. This implies that the encoded RIFIN has an important function in the developing gametocyte. However, expression studies of STEVOR in gametocytes have shown that the timing of protein expression and localisation may be uncoupled from that of transcription . RIFINs could play a role in the sequestration of gametocytes, but the fact that the PF13_0006 transcript was maintained at high abundance in the non-adherent circulating stage V gametocytes makes it less likely that this protein is responsible for the sequestration. It is intriguing that PF13_0006 also dominated the rif transcript profile of sporozoites. It has previously been shown  that the transcription of PF13_0006 and PFI0025c during asexual blood stage development differs from that of most other rif genes in that they dominated the transcript profile in the late schizonts and in the early rings. The profile was unlinked to the rif transcript profile during the mid ring and early trophozoite stages and the VSA-phenotype of the parasite. This finding led to the suggestion that the proteins encoded by these two genes may be associated with the free merozoite stages. PF13_0006 may serve different functions depending on the developing pathway of the parasite; however, a common feature for extracellular gametes, sporozoites and merozoites is the need to "locate" another cell; sporozoites and merozoites in the bloodstream binding to hepatocytes and erythrocytes, respectively, and female and male gametes inside the mosquito midgut binding at fertilization. A role for RIFINs in these extracellular stages is at this point speculative but could include sensing, binding or both. However, localization of these RIFINs needs to be investigated, as surface expression on gametocytes, gametes, sporozoites, and merozoites has not as yet been established. The transcription of rif genes is unlinked to var transcription in developing gametocytes and although PfEMP1 may have a role in sequestration of developing gametocytes to different host ligands, the function of RIFINs during gametocyte maturation remains to be confirmed. In conclusion, this study has demonstrated that the rif transcript profile of gametocytes is unlinked to that of asexual progenitors. In particular a single rif gene, PF13_0006, exhibits a consistently high transcript abundance in mature gametocyte stage V and in sporozoites. If homologues RIFINs of the B1-type are expressed on the surface of gametocytes, sporozoites, and merozoites of different origin this could lead to a possible vaccine candidate in all stages of the parasites life cycle. The study was supported by a Grant from the Foundation for the National Institutes of Health through the Grand Challenges in Global Health initiative. CWW was supported by the The Danish Medical Research Council (grant reference number 271-08-0540). The critical and highly professional support by Marga van de Vegte-Bolmer with gametocytes and Geert-Jan van Gemert for sporozoites are highly appreciated. CWW carried out molecular biology studies, analysed data and wrote the paper. TL, SBM and TGT participated in the design, coordination and analysis of the study and helped to draft the manuscript. CJS, SS, and SS participated in the design and coordination of the gametocyte studies, helped analyse data and draft the manuscript. CCH and RWS participated in the design and coordination of the gametocyte and sporozoite studies, helped analyse data and draft the manuscript. All authors read and approved the final manuscript.